Christmas wouldn’t be Christmas without someone in the household being eager to try out a new gadget – only to realise that someone didn’t read the ‘requires two AA batteries (not included)’ small print. Stop tears and tantrums (from the grown-ups as well as the kids) by stocking up early. Poundland have a great range of batteries to keep you charged up this Christmas. The Liberty Top Tip: With packs of batteries being priced at only a £1, why not be super savvy and stock up on a variety of different types? That way, you don’t have to do that last minute dash to the shops after you’ve read the small print. How many times have you had a neighbour pop in unexpectedly during the season and due to the festive frenzy, you have nothing to offer them? 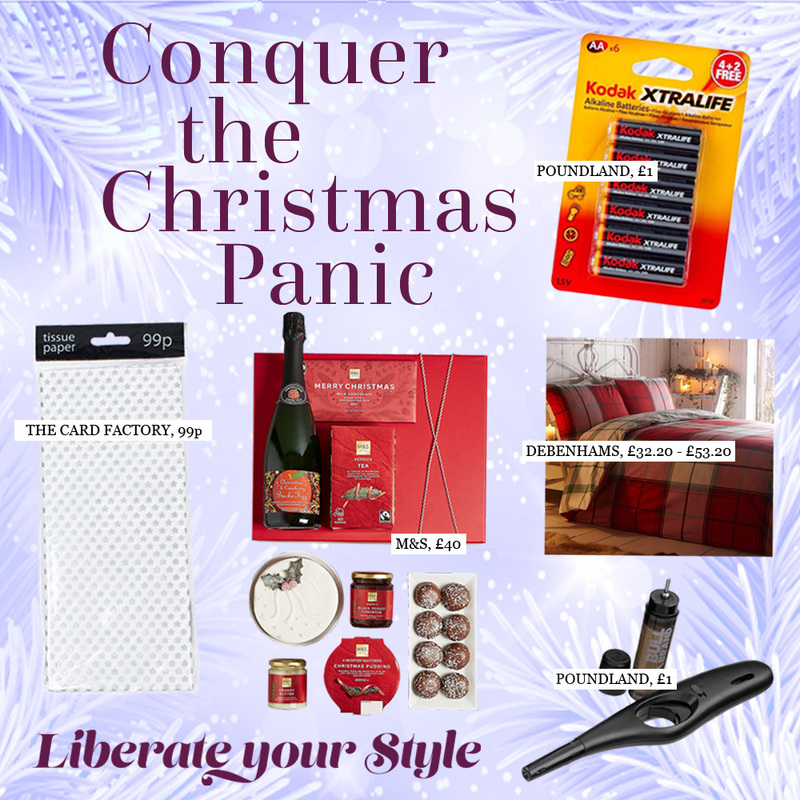 Make sure you pick up some supplies this Christmas to be the street’s host with the most. This Classic Christmas Gift Box With Fizz (£40) from Marks & Spencer is great to have in for emergencies and can always be enjoyed by yourself if not given away. What’s a Christmas without candles? Make sure you don’t get caught in the dark and stock up on matches in advance! The Liberty Top Tip: Why not head to Poundland and try out an alternative? The Utility Lighter (£1) holds a flame for longer – why waste time lighting just one candle when you can light all of them at once?! Unfortunately, most of us don’t have elves on hand to visit your house at night and wrap up all your presents for you, make sure you’re up to your eyeballs in wrapping paper to avoid that last minute dash. Check out this Silver Star Print Tissue Paper (99p) from The Card Factory. For under a pound, this subtle wrapping option is suitable for kids, men and women of all ages and is also ideal for filling gift bags. The Liberty Top Tip: It’s all well and good bringing home the paper, but make sure you don’t forget the sellotape! Once again, Card Factory has got you covered. It’s a wrap! If you’ve got family staying for Christmas, ensure you’ve stocked up on fresh bed linen and towels before their arrival. This Home Collection – Espen red check winter bedding set (£32.20 – £53.20) from Debenhams is the ideal seasonal set to wow your guests and is 100% brushed cotton to ensure a toasty nights sleep during the colder months.